In spite of what some experts and gurus publicly claim, EVERYBODY is feeling the effects of this recession. Well, is it actually a “recession”? Is it the inevitable result of a carefully calculated and heinous devaluation of a fiat currency, meticulously designed to slowly and quietly transfer all the wealth from the “sheeple” to the ingeniously evil people who created said fiat currency in the first place… in full collusion with the U.S. gummint… and deceptively established in complete arrogant abrogation of the U.S. Constitution on December 22, 1913? Anyhoo… most business people are feeling this crisis, whatever you choose to call it. Most are having to work twice as hard for 50% less results than just a couple years ago. And I ain’t happy about it… but dem’s da breaks, iddn’t it? Well, let me see if I can give you a quick little tip to boost your return on investment from your advertising dollars and help you make more money… in spite of the economy. Most entrepreneurs are now forced to evaluate each and every expense and ruthlessly slash every one that isn’t bringing back an acceptable return on investment. Penny Wise & Pound Foolish! I was being a cheapskate about investing some money in a back-end promotion. Even though I have 16 years of rock-solid proof and in-the-trenches experience showing, beyond a shadow of a doubt, that this type of back end promotion has ALWAYS been the most profitable thing I can possibly do in any business… bar none. But there I was, figuring out how to “cheap out” and get this promotion cost down to $1.00 per person… or less. Getting a new customer is the most expensive and LEAST profitable thing you do in any business. For example, I’m investing anywhere from $35 to $85 to get a new customer on a $40 front end product. Now why, pray tell, wouldn’t I be willing to invest the same amount (or more) to KEEP a customer? I immediately changed my mindset and starting thinking about how to make this back end promotion much more valuable to my customer… therefore, much more expensive, too. It wound up costing about $35 per customer to do this back end promotion. But to insure its success, I applied my meticulous list segmentation secrets and pulled out all the “gems”… the absolute best cream of the crop customers on the list. Kinda costly back end promotion, right?. Big difference between $1/person and $35/person. That one promotion so far has brought in a MINIMUM of a 576% ROI! The reason I say “minimum” is because it’s a continuity program and the 576% ROI is based on how long they’ve been in the program to date. If you care to know, the copy for this promotion was written by me and Caleb Osborne. Now this promotion only went out to about 100 people. Now even if response starts declining as much as 50% or more, imagine what’s going to happen when I start rolling this out to the rest of the 37,000+ paying customers on the list! By all means, watch expenses like a hawk… but don’t don’t cheap out when it comes to investing your advertising dollars in consistently working your back end and keeping your customers happy. "GO FROM SIX TO SEVEN FIGURES… …AND BEYOND!" 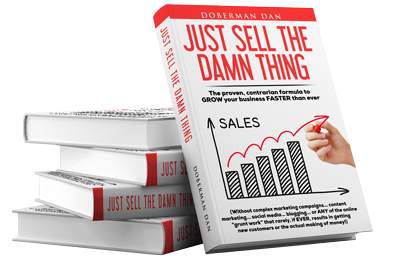 … And without all the other “grunt work” that rarely – if ever – results in getting new customers and making money! Is The 3-Day Work Week The Secret To Maximum Productivity? Copyright 2014 © Doberman Dan. All Rights Reserved.